Enough soup for an army. The perfect cure for a horrific hangover. 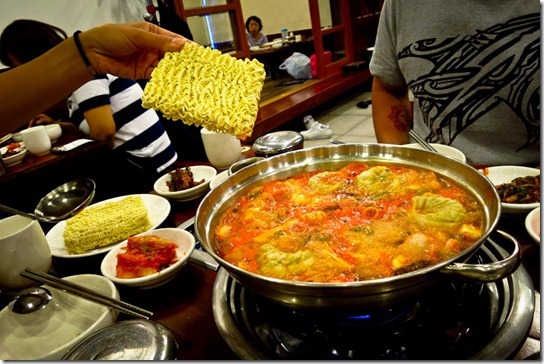 Budae jjigae literally means “army base stew”. After the Korean War, food was pretty scarce in Seoul. 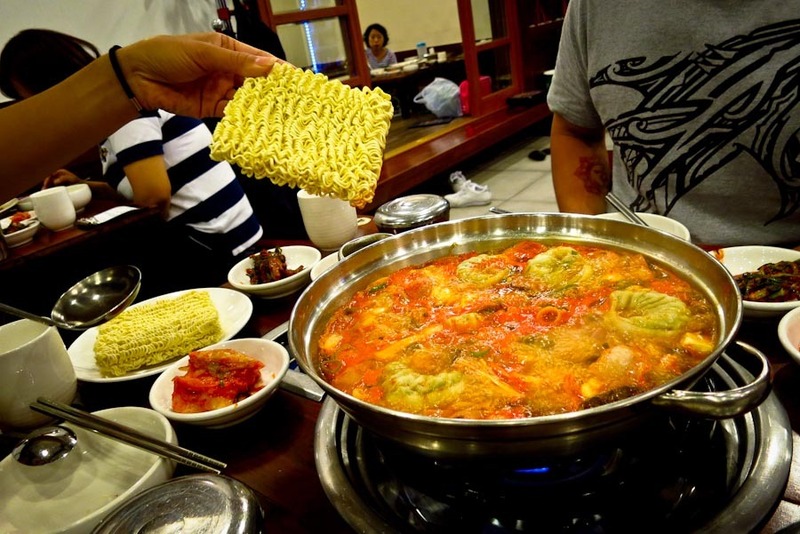 The people made use of the surplus foods available from the U.S. Army bases – things like canned ham, hot dogs, Spam – and whatever else was available were incorporated into a traditional spicy soup flavored with red chili paste and kimchi. Today, it’s the perfect hangover soup. Traditionally, haejang guk is the go to soup for the hangover cure. I prefer this hodgepodge everything-but-the-kitchen-sink budae jjigae stew. Modern ingredients today include any thing from sausages, hot dogs, onions, tofu, garlic, scallions, mushrooms, vegetables, dumplings and, my favorite touch, instant ramen noodles. Our little old Korean lady brought us dish after dish after dish. And when she was through with the sides and extras, she brought us more spicy broth for our stew. There were only 3 of us. The table beside us, a group of young men, early twenties I would imagine, in uniform. They were laughing and drinking and toasting to one another. They had just finished their military services and are now returning home. So, whether you are recovering from a night on the town or celebrating a joyous occasion, enjoy a meal fit for an army. Enjoy soup! What’s your go-to cure for a hangover? Great description! 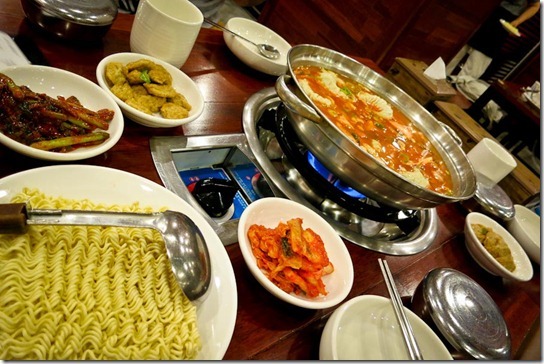 I love budae jigae. Definitely good hangover food for when you are in Korea. Wish I had a go-to cure for a hangover! My go-to hangover food is usually something super unhealthy. I don’t know if it’s the placebo effect or what, but for me regular Coca Cola and junk food usually helps.